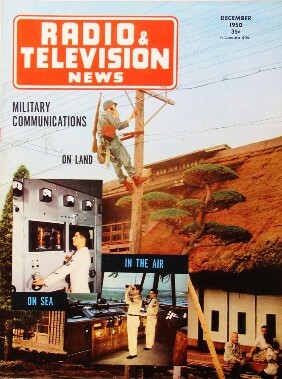 The December 1950 issue of Radio & Television News ran a series of articles on Navy communications. This was a mere four years after the end of World War II and right at the beginning days of the Korean War. Communist and fascist regimes never give the world a moment's rest (some - not me - think just being nice to them will cause them to be nice in return). Discussed here are issues still relevant to modern outfitting of naval assets with new or updated communications equipment. Unlike land-based systems, naval environments impose increased requirements for ruggedness due to harsh vibration, impact, and corrosion issues. Weight added above the waterline needs to be offset with weight below the water line to preserve stability. Reliability and personnel training also need to be increased because being at sea means access to replacement parts, operators, and service technicians are harder to accommodate. The military people (officer and enlisted) who do the work do so out of dedication and a sense of honor and country. Otherwise, why would they accept pay and living conditions far inferior to the average New York City garbage collector? Graduated U. S. Naval Academy In 1926, completed post-graduate course in electronic engineering in 1935. 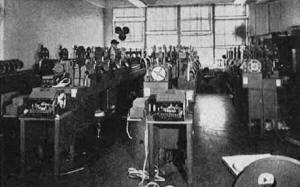 Officer-in-Charge of U. S. Navy Radio Material School at Anacostia, D.C. from 1938-49. During war served as Communication Officer attached to British Combined Operations Staff, attached to Allied Forces' Headquarters (North African Campaign), served on USS Yorktown, and become Communication Officer, U. S. Naval Forces (Europe). Except for two years in San Juan, Puerto Rico, he has headed the Equipment Engineering Section of the Division of Naval Communications since 1945. A "behind-the-scenes" review of the problems involved in coordinating the U. S. Navy's vast research, procurement, and installation programs. The Naval Communication Service is provided for by the Navy Communication System (shore stations) and shipboard radio facilities. The shipboard facilities provide communication channels between ships, fleet, and task force commanders. Ship-shore and air-ground circuits are part of the entire service. 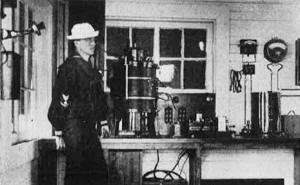 The primary, major, and minor relay stations of the Naval Communication System employing wire and radio systems both automatic and manual, handle the Navy's point-to-point traffic and fleet broadcasts. To maintain this service, both shore station and ship require the very latest and most modern type of communication equipment. To accomplish progressive improvement in fleet communications, the Office of Chief of Naval Operations' staff includes trained electronic officers who are thoroughly familiar with ship and shore communication systems. These officers hold membership in various Joint and Combined Electronic groups, Electronic Committees of the National Research and Development Board, the Munitions Board, the International Telegraph Union, and many other civil and military electronic organizations. Careful attention is paid to system-wise engineering to insure that communications can be maintained with the U. S. Army and the Air Force units, certain foreign military and commercial systems, as well as with domestic U. S. commercial systems. 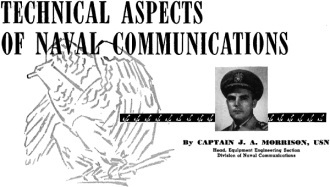 Technical reports from the civil and military research laboratories are carefully reviewed in order that new methods or techniques that have military application may be considered and adopted, if improvement to naval communications is indicated. As technological advances in design of new weapons are made, either by unfriendly nations or by the United States, tactics or counter tactics are developed in our operational planning sections to take advantage of, or overcome them. 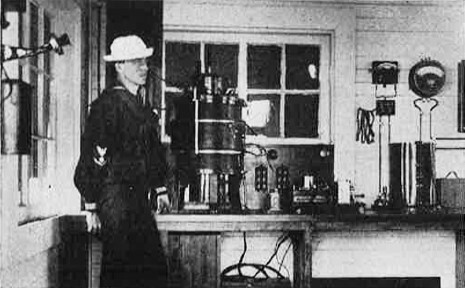 Interior of an operating building at U. S. Naval Radio Station, Mare Island, California in 1904. Note "dated" equipment. Monitoring equipment, installed at Navy Radio in Washington, D. C., makes a record of all transmissions over the system. 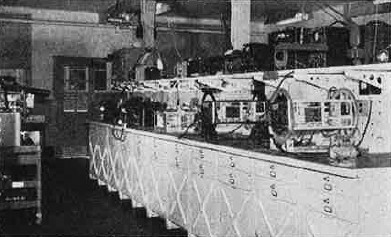 A Navy workshop setup for testing and repairing aviation communication and other electronic equipment. 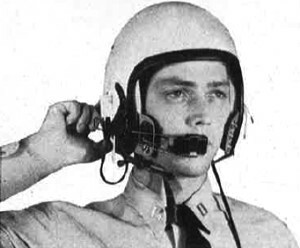 This protective helmet for pilots is literally "wired for sound." It contains a built-in headset and an adjustable microphone unit. 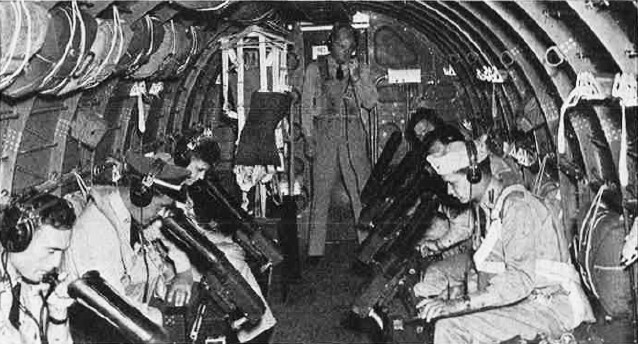 Navy communication and radar training on board an R4D (Navy's version of the AAF's C-47 Dakota) electronics flying classroom. 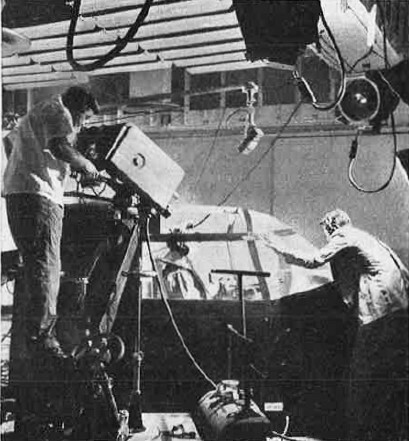 A television camera peers into the cockpit of a mock-up Navy bomber as the "pilot" and "co-pilot" demonstrate a simplified control system. By means of microwave or coaxial cable relays the demonstration can be witnessed by personnel at remote naval stations or units of the fleet. The Navy is experimenting with mass training by television at Sands Point, Long Island. This ever-changing struggle presents naval communication equipment and system engineers with the task of not only satisfying current requirements, but at the same time solving the problem of arranging research, development, procurement, and installation programs to insure that equipment and systems, sometimes of comparative radically changed characteristics, will be available should war come suddenly. 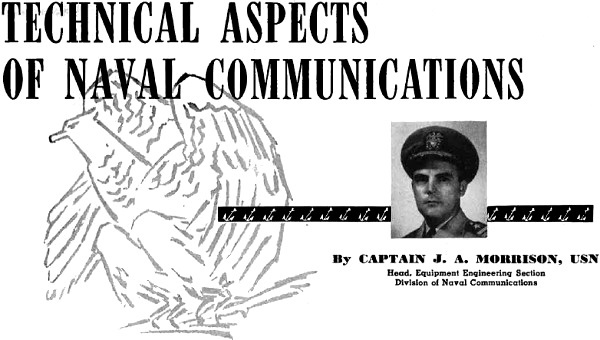 As far as the Navy is concerned, when it is realized that from writing the specifications to the completion of the installation in all ships of the fleet of just one piece of communication equipment, may take as long as four years, even under wartime production schedules, the job of keeping fleet communication systems fitted with equipment of advanced design can be appreciated. To insure that the best equipment available is purchased, a considerably complicated process must be followed. A government purchase involving the taxpayers' money must be justified as thoroughly as practicable, and all manufacturers must, under the law, be given opportunity to obtain the contract. The primary requisite for a justification is known as an operational requirement. Operational requirements originate in the Office of the Chief of Naval Operations, and are based upon fleet doctrine, fleet tactics, and ship developments. Since shore stations exist fundamentally to support the fleet, an operational requirement for shore communication equipment generally stems from a fleet requirement. These operational requirements are studied in the Naval Communication Division of the Navy Department, and from these studies are determined the allowances of equipments per ship and shore station that will fulfill them. The equipments required are listed by frequency range, distance coverage necessary, and the type of emission desired. In the case of ships, the requirements are listed in a Tentative Type Allowance, one being prepared for each type of Navy ship. The Bureau of Ships proceeds to fill this allowance with equipment available. If the equipment available will not meet the specified requirement, or cannot be economically modified, then new equipment must be developed and procured. The first step in the development of new equipment is to write a set of military characteristics. These characteristics are written in broad terms to cover fully the operational requirement. After the preparation in the Office of the Chief of Naval Operations, the characteristics are submitted to the Joint Communications Electronics Committee of the Joint Chiefs of Staff, which is composed of representatives of the Army, Navy, and Air Force. The characteristics are studied for possible joint interest, and yield information as to whether equipment already exists, or is planned, that will fill the requirements. Technical and operational sections of the three Services study the characteristics and determine whether or not there is a joint interest in the proposed development. After approval of the Joint Committee, the characteristics are forwarded to the Bureau of Ships. As the next step, the Bureau of Ships, using the military characteristics as a guide, writes a set of technical specifications. Here, in the interest of economy, before a contract is placed, coordination to prevent undesirable duplication of effort is achieved. A proposed Research and Development project is forwarded to the Electronic Committee of the Research and Development Board for consideration. This committee comprises representatives of the three Services, as well as civilian members eminent in the electronics field. After similar development projects are scrutinized, and if no undesirable duplication is apparent, the Research and Development Board approves the project. The specifications are then submitted to manufacturers for contract bids by the Bureau of Ships, and after the bid has been awarded, the research and development stage follows, under the close supervision of Navy engineers. The acceptance tests follow the development, and finally the service evaluation tests are conducted aboard a station or ship before the equipment is approved and purchased. In the case of shipboard equipment, the service tests are performed by the Commander, Operational Development Force who has available to him highly qualified technical personnel and various types of ships and aircraft for which the equipment is intended. The service evaluation tests consist of actually using the equipment under conditions which duplicate its ultimate employment, with naval personnel operating and maintaining it to make absolutely sure that it will fulfill the operational requirement, and meet the rigid physical standards imposed by the specifications. The foregoing procedure, while it is admittedly slow, assists greatly in providing for the U. S. Navy reliable, rugged, and compact communication equipment, as economically as possible, and with the least impact possible on research and manufacturing agencies. The communication equipment for the U. S. Navy falls generally into two groupings: (1) shore, and (2) ship. Shore station communication equipment must possess all of the features of reliability, long life, stability, and low maintenance, the same as shipboard equipment. Certain features, such as ruggedness, small size, and weight are not so important. Shore stations exist to provide long distance communications in large volumes; hence, the equipment is large and powerful, and no limits are placed upon the size of the radiating system required for the job. Transmitters in the order of 500 kw. to 1000 kw. are used, together with huge amounts of terminal equipment for single side-band and electronic multiplexing. Very low frequency transmitters give the fleet world wide broadcast coverage. Transmitting, receiving, and control stations are separated by several miles, and thus must be linked to­gether with landline or v.h.f. control links. Recent developments indicate a trend toward PTM (pulse time modulation) for replacement of the very-high frequency links. PTM offers more flexibility and more channels for the Navy's operational requirements. Shipboard installations are restricted in size and weight, depending upon the type of vessel involved. Practically, this means that on some ships when a piece of equipment of any sort is placed in a ship the weight added must be compensated for; either by removing an equal weight, or if the equipment is installed above the water line, an equal weight must be inserted near the keel to preserve the stability. Similarly, space being at a premium in war vessels, consideration must be given the size of the equipment in order that other essential material may also be accommodated. This explains why those portions of Naval military characteristics and technical specifications which have to do with size and weight are most rigid and severe. In addition to the size and weight factors, because of the extreme ranges of temperature, exposure to salt water spray, deterioration due to humidity and the wear and tear of a ship at sea to which the equipment is subjected, the problem of providing adequate equipment to meet the numerous operational needs is not an easy one. 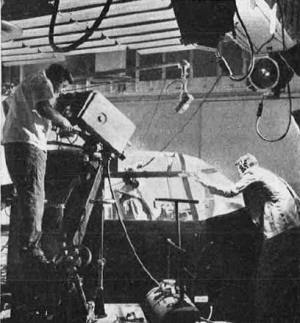 The limited space above decks, for which requirements for guns, radars, signal searchlights, and other special electronic devices compete with increased numbers of communication antennas to meet expanding circuit requirements, all of which specify omni-directional coverage, has placed increasing demands upon Navy Engineers for efficient antenna systems. Such research is a continuing project within the Navy, and of late years, considerable emphasis has been accorded it. Recently developed common antenna working systems show promise of producing some gratifying results. In general, shipboard equipment is growing smaller, more compact, more stable, lighter, automatic, and rugged, It is hoped that miniaturization of components will reduce further their size and weight. On the other hand, the effort to meet the ever growing operational requirements and at the same time reduce the size and weight has introduced, in some cases, more complicated and complex equipment. This is a serious problem in view of the present shortage of Navy Electronic Technician Mates. Therefore, specifications are beginning. to emphasize packaging of components for quick replacement to enable disabled equipment to remain on the air. The repair of the particular circuit can be accomplished at a later time. As a result of a standardization program, it is planned to replace the various models of transmitters and receivers installed aboard our ships with an all-purpose series of transmitters and receivers. This modernization will assist to some extent in reducing the maintenance and spare parts provisions and stowage problems. The latter is one which has long plagued the logisticians. With numerous different types of equipments installed in ships, the provision and stowage of sufficient spare parts for self-sufficient operations presents many space and weight compensation problems. By standardization of equipments, components, and revising stowage methods aboard ships, a reduction of perhaps 50% in cubeage and weight per ship is anticipated. The ultra-high frequency band was chosen because of the possibility of obtaining more channels to provide for our tactical requirements. It is an all-purpose band and will be used by all three military services on air-to-air, air-to-ground, and ground-to-ground circuits. Considerable difficulty has been experienced in developing equipment in this band, mainly because of frequency stability considerations; however, the demanding specifications have brought about successful research on new circuits, new techniques, and new automatic control devices and considerable progress has been made. For instance, the perfection of techniques to realize narrower channel bandwidths has produced nearly double the communication channels than was hoped for originally, Since this equipment must be installed aboard all types of ships and craft, as well as planes, attainment of small size and weight are being emphasized. This u.h.f. system will ultimately replace the very-high frequency system now in use. Increasing traffic loads and high speed targets have resulted in more and more emphasis being placed upon the use of automatic equipment. The manual c.w. circuit is considered the "horse and buggy" type of communications and, like the horse and buggy, is highly reliable, but very slow. The teletypewriter program is an effort to shift naval communications from the manual method to the machine method, and has been successfully accomplished in the Navy Communication System (shore stations). A partial shift has been made in the fleet in that ship-shore teleprinter circuits exist for the use of those ships equipped with radio teletype equipment, It is hoped that the fleet broadcasts may soon be made by this method. Radio teletype equipment aboard ship is up against the same old problem of weight and space. Hence, new equipment is being developed that is smaller, lighter, and more compact - a distinct advance. In line with the trend toward automatics, the radiophoto-facsimile program is the latest additional service to be provided by the Naval Communication Service. The operational requirement for the transmission of maps, charts, and official documents has spurred on the development of radiophoto-facsimile equipment. Future developments indicate strongly that this equipment will become an integral part of shore station and shipboard installations. Considerable thought has been given to multiplexing equipment for increasing the capacity of the existing communication circuits. The limited frequency spectrum available has encouraged this development. Looking into the future, more and more attention will be paid to data transmission systems. In this atomic energy age, faster and faster methods of communications will be necessary to support military operation. Furthermore, with the U. S. Armed Services working as a team with allied forces, coordinated communications are a must. All equipment developments must continue to be done along joint specifications so that the Services can work easily into each others' systems. Military characteristics will insist that equipment be developed for joint use, that it be reliable, small and compact as possible with miniaturized components, stable, easily serviced, rugged, and easy to operate and that certain features be automatic. In this manner the U. S. Navy will continue to obtain the best equipment for war purposes that money can buy.